I just finished listening to an outstanding book that I hope will be widely read: The Hell of Good Intentions: America’s Foreign Policy Elite and the Decline of U.S. Primacy. 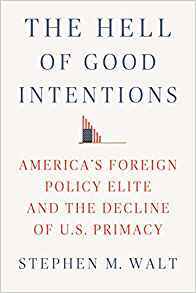 It’s a study of what the author, Harvard Kennedy School professor Stephen Walt, calls liberal hegemony, a foreign policy worldview Walt persuasively argues has been disastrous for America and for the world. As the jacket puts it: “Since the end of the Cold War, Republicans and Democrats alike have tried to use U.S. power to spread democracy, open markets, and other liberal values into every nook and cranny of the planet. This strategy was doomed to fail, but its proponents in the foreign policy elite were never held accountable and kept repeating the same mistakes." As I listened to the book, I found myself thinking that liberal hegemony might be best understood as a kind of secular religion. It has its own priests (whose views often differ from those of lay people); its own orthodoxies (and apostates); its own catechisms. I’ve read studies of how, when a cult believes the world will end on X day and the event doesn’t happen, the cult doesn’t abandon its belief but instead rationalizes the inconsistency, and the psychology there is also reminiscent of liberal hegemony’s refusal to reconsider dogma and resistance to contrary evidence (and even common sense). All of which is doubly interesting when you consider the way many Americans have been trained to cherry pick religiously inspired violence as the only violence worthy of condemnation. “They kill in the name of Islam, what other religion does that?”…that kind of thing. But the psychology of religion manifests itself more broadly than is immediately obvious, and certainly more people have been killed in the name of liberal hegemony than in the name of other, more obvious gods. I’ve come across two reviews of the book that I think deserve mention. First was this one, from the Guardian. Overall it was positive, but the writer seemed to be doing the thing where he was afraid of seeming too effusive, so he invented a couple of mild criticisms at the end that were neither warranted nor even coherent. First was chiding Walt for “discounting the possibility that Iran harbors ambitions as a regional hegemon.” Of course Iran would like to be a hegemon—who wouldn’t? I confess that given the opportunity, I myself would probably opt for some sort of personal neighborhood hegemony—it would be a great way to get people to obey the speed limit, talk more softly on their cellphones, and clean up after their dogs. The point of offshore balancing, Walt’s proposed alternative to liberal hegemony, is that it’s a response to the given of hegemonic ambitions. In other words, to paraphrase Madison on “If men were angels, no government would be necessary,” if countries (including Iran) didn’t seek hegemony, offshore balancing would be largely pointless. Discount hegemonic ambitions? On the contrary, the existence of those ambitions is what offshore balancing is built on. The second quibble in the review was that in 2010, Walt looked at Libya as a U.S. policy success. Now, I don’t know anyone beyond John Bolton who would claim that Gaddafi giving up his quest for nuclear weapons as a result of diplomacy was a bad thing. And if it hadn’t been for the excesses of liberal hegemony and a spasm of “R2P" rationalizations, we might not have gone to war (oops, “intervened”) in Libya in 2011 and turned the country into the failed state it remains today. So criticizing anyone for praising the way the United States handled Gaddafi in 2010 is bizarre. The was an important substantive point—the people who have been consistently wrong have been promoted; the people who have been consistently right have been ignored. Is that even remotely disputable? And even if it were, Walt provides a mountain of evidence to back up his argument. The mention of that letter was only a small bit of it. Walt also had a lot to say about journalists and others who’ve been consistently wrong, and how they keep failing up. That’s a critical substantive point; to try to dismiss it as nothing but personal disappointment is just weird. Especially because even if it were motivated by personal disappointment—and again, it didn’t strike me that way at all—Walt's substantive point would still stand, and still be important. Wait, why is that rhetorical overkill? Walt provides a ton of evidence in support. If Heilbrunn disagrees, of course that’s fine, but he can’t just dismiss the argument without also addressing the evidence! Walt points to the Council on Foreign Relations, the Atlantic Council and the Center for New American Security, among others, as constituting a kind of interlocking directorate that fosters groupthink and consists of mandarins intolerant of dissenting views. But Walt’s depiction of these organizations misses the mark. There’s plenty of debate in Washington; whether it amounts to much is another question. It’s as though Heilbrunn is so deep in a box that he can’t see, even when someone shows him what’s going on with a flashlight. Because sure, there’s plenty of debate. Just like there’s plenty of debate between the Democratic and Republican wings of the party on how much more we should spend on the military—should we spend a lot more, or a really lot more? But that’s a very narrow permissible band of meaningful debate. And the only way someone could miss that is by implicitly buying in to the notion of what’s permissible, and treating anything else as unworthy of consideration. Which is exactly Walt's point about groupthink and intolerance of dissent. Not that the offshore balancing Walt proposes in lieu of liberal hegemony goes remotely that far—but you get the idea. In truth, any president who announced such a strategy would immediately initiate a free-for-all around the globe as local potentates tested Washington’s resolve. But Walt address this assumption—and it is an assumption, or, as I think it’s better understood, a core tenet of the Liberal Hegemony faith. Again, it’s fine if Heilbrunn disagrees, but to do so meaningfully he needs to engage Walt's point that it *is* an assumption, with no empirical evidence behind it (and in fact lots of evidence of the contrary). Walt also makes the easy assumption that America can remain a pre-eminent power, but the mounting national debt and Trump’s steady conversion of the country into what amounts to a rogue state could lead to a very different outcome. Soon Americans may discover that the only thing more vexing than exercising dominance is forfeiting it. This was mostly incoherent, but it also wandered beyond incoherence into a weird realm of deafness to what Walt is actually arguing, which is the opposite. Liberal hegemony isn’t just unnecessary and counterproductive; it’s also ruinously expensive. Continuing to pursue it is what causes increased debt. Walt didn’t assume anything—he cautioned that if America wants to remain solvent, we need a way to get more realistic about what commitments are worth investing in and paying for. Or to put it another way, of course "America can remain a pre-eminent power”—Walt provides a ton of examples and evidence of all our natural advantages (oceans east and west, friendly neighbors north and south, abundant natural resources, etc). We just have to stop doing the galactically stupid stuff, and we ought to be fine. It’s like a person of normal health can remain generally healthy—if he just stops the binge drinking and gets a little sleep. That’s not an assumption, it’s a description of reality—and sound advice from a good doctor. But advice from all the good doctors in the world won’t make a bit of difference if the patient is determined not to hear. If the patient wants to get well, a good first step would be to heed the wisdom in this book. There are a lot of terrific blogs out there on the world of writing, but Heart of the Matter isn't one of them. HOTM primarily covers politics, language as it influences politics, and politics as an exercise in branding and marketing, with the occasional post on some miscellaneous subject that catches my attention. HOTM has a comments section. Sounds simple enough, but as even a cursory glance at the comments of most political blogs will show, many people would benefit from some guidelines. Here are a few I hope will help. 1. The most important guideline when it comes to argument is the golden rule. If someone were addressing your point, what tone, what overall approach would you find persuasive and want her to use? Whatever that is, do it yourself. If you find this simple guideline difficult, I'll explain it slightly differently in #2. 2. Argue for persuasion, not masturbation. If you follow the golden rule above, it's because you're trying to persuade someone. If you instead choose sarcasm and other insults, you can't be trying to persuade (have you ever seen someone's opinion changed by an insult?). If you're not trying to persuade, what you're doing instead is stroking yourself. Now, stroking yourself is fine in private, but I think we can all agree it's a pretty pathetic to do so in public. So unless you like to come across as pathetic, argue to persuade. 3. Compared to the two above, this is just commentary, but: no one cares about your opinion (or mine, for that matter). It would be awesome to be so impressive that we could sway people to our way of thinking just by declaiming our thoughts, but probably most of us lack such gravitas. Luckily, there's something even better: evidence, logic, and argument. Think about it: when was the last time someone persuaded you of the rightness of his opinion just by declaring what it was? Probably it was the same time someone changed your mind with an insult, right? And like insults, naked declarations of opinion, because they can't persuade, are fundamentally masturbatory. And masturbation, again, is not a very polite thing to do on a blog. Argue with others the way you'd like them to argue with you. Argue with intent to persuade. Argue with evidence and logic. That shouldn't be so hard, should it? Let's give it a try. WikiLeaks - "The Intelligence Agency of the People"
Excited to Help Launch The Correspondent!